I agreed to tackle the project for our Nottawasaga Club layout. We are recreating the line from Barrie to Meaford, Ontario in the mid '50s. Work is well underway. You can find out more about our layout on the NMR page. The completed scene will include the dam and falls and the road bridge that are behind the railway bridge and trestle. I am handling the first part: constructing the bridge and trestle. 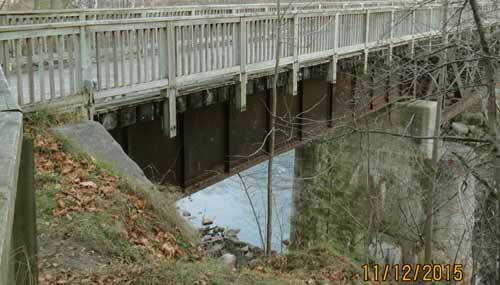 Several of our members had already done a field trip to photograph and measure the bridge. It is 33-feet above the river. I had to selectively compress the length of the bridge to 174 scale feet to fit the space we had available at the front of the layout. It will be one of the first things seen when entering the clubhouse. Here are a few views of the bridge as it exists now. 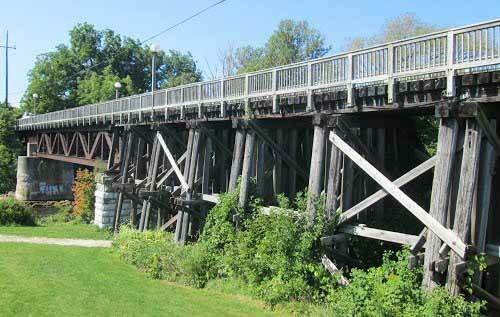 The railway has been abandoned and the bridge now has a walking deck and railing. I am omitting those because I want to replicate the bridge as it would have looked in the 1950s. I also ignored any graffiti. 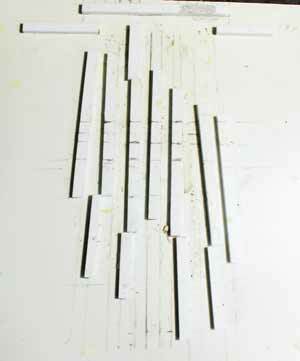 The first step was to cut out the area to be used (approximately 25 1/2"x24"). Brad Lebeck (chief engineer!) created an open box that could be hung from the benchwork. I was them able to do all the work at home which made it much easier. I began by drawing the plan on cardboard and after adjusting it to fit I redrew the placement of the piers on the plywood base. The bridge ties are by Central Valley, the end abutment is an old one I had (I think by Chooch) and the concrete pier is by Aim. I had to reduce the height and notch it to fit a 30-foot MicroEngineering steel bridge on the right and a kit bashed Atlas bridge on the left. The Atlas bridge had to have new beams cut to square the ends. The left end of that span had to have its "shoes" resting on a random stone pier. I used an old Chooch pier I had. It also had to be reduced in height and turned out to be one of the more onerous tasks because it was cast in resin. I used several Dremel discs, X-Acto blades and files to slowly cut through it. I decided it was easier to build the terrain first and add the piers afterwards. This would make it easier to construct the trestle bents. 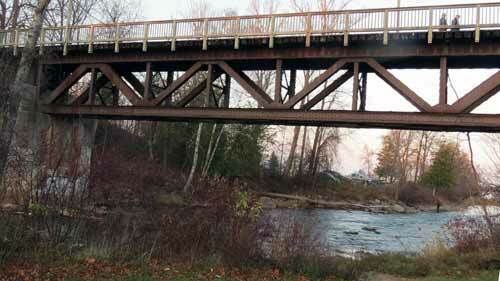 The terrain is steep on the right side and slopes more gently on the left under the trestle. The trestle legs are on dry land while the piers are at the edge of the river. I used layers of construction foam covered with plaster cloth and a layer of hydrocal plaster. The scenery base is a mixture of Woodland Scenics ground foam and various trees and bushes. The river is a coating of hydrocal to hide the plywood grain and this is painted with black paint and some acrylic washes of brown and green. "Water" won't be poured until the dam and other work is done. Now I could set the piers properly. You'll notice that I strung a piece of string to set the top of the ties. I temporarily built up the roadbed and ties at each end of the bridge and held the string in place with thumb tacks. Disregard the slight distortion on the photograph. The track is level! This is how it looked before starting on the trestle. I had added some rubble along the river banks. I pre-stained all the wood for the trestle. I roughly followed the dimensions from Paul Mallery's Bridge and Trestle Handbook as a guide. The wood is mainly Mt. Albert Scale Lumber. The bents are scale 12 x 12 with smaller size cross bracing. The stringers lengthwise under the ties are 16 x 4 and help to hold the trestle section together. Hunterline Weathering Mix and MicroMark's Age-It alcohol washes were used to stain the wood. 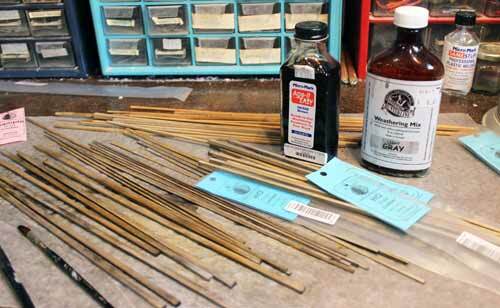 Pre-staining is important because the wood glue will block the stain from penetrating the wood. I used a few soft brushes but sometimes using your fingers and a piece of cloth works well to wipe on the stain. The trick is to make the pieces somewhat different in colouring. I made a jig for the trestle bents on a piece of scrap styrene. Each bent had to be a different length so I would mark the length with a pencil as I went along. The jig held the bents in place while the glue dried. This trestle had 6 legs where many I've seen have only five. The bents were also doubled next to each other. I tried to follow the photos as closely as I could. I spaced the bents approximately 15 scale feet apart. I would measure the length from the base of the stringers to the ground and build accordingly. I sanded off a bit of the legs when necessary. 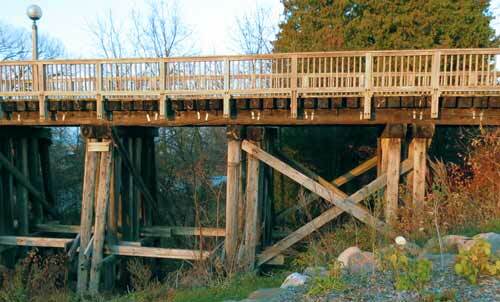 The bridge and trestle were not glued to the piers or scenery. The entire bridge construction can be lifted out for inserting into the layout and can be removed for work on the dam and road bridge. Here's the final scene after placement. I added a fisherman on the left bank. Other detailing can be done later after the water is added. At least trains can now run on the mainline again. Follow along the railway's construction at our NMR club page. Go from "bridge-construction" to the Scenery overview. Return from "bridge-construction" to my Home Page.